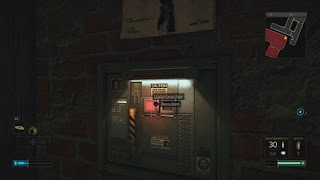 In Deus Ex: Mankind Divided, you travel to Golem City and only when you are back in Prague again, you can find the side mission SM 06: 01011000, location: Davny Ctvrt Station (top right in green). Go down the subway station, there you’ll find an ad that seems to have an error. A mysterious electronic voice speaks to you as soon as you interact with the poster. You find that voice and help her. In your menu a new POI: entered fault. Follow this for Capek Fountain Metro Station (red, below). The POI will lead you to an electronics trading and a mysterious friend opens you all closed doors. Go to the basement and interacts with one of the laptops to speak with the voice. Select the Messenger and you learn more about your new friend. Probably you don’t have to check with Helle, but you get then no further story elements. Helle gives you the code for the Office - This is 1591, SM 06: 01011000 starts from that point. The mysterious voice asks you to pick up a package at the nearby parcel center. Of course, it is closed and therefore you need the above code. Select SM 06 in the menu at the side missions and follow the waypoint to the package center. On the way you will re-contact Helle and explain some circumstances.. The path leads you to a kind of storeroom. With appropriate augmentations you can lift the heavy box and turn the wall behind you. You can run through the electric field. Hurry up and flip the switch, so the current is interrupted. - Enter to a room by ventilation shaft. Go inside and follow it to another room. It is a locked zone in which there are three opponents. - Sneak out of the bay and wait briefly until all three are in the middle of the room. Now you can press the circuit breaker (see picture) and kill them in this way. - Search the body of the mercenaries and you find a PDA. Read the content in order to be prepared for future conversations. - Go near to the locked door and Helle will help you. Enter the code 1591 to the panel. - Grab the floppy disk from the counter, and this part of side mission 6 is done. If you have picked the disk, then you access the data. Since it is an obsolete storage media, you have to consult a special store that has such ancient Reader. For this, you need to go to Davny Crvrt (green dot, top right). Follow the waypoint to the subway. Your next stop is a shop with antiques, which certainly has the necessary reader. The waypoint leads you straight there. The seller sends you down to the basement. Once at the bottom you notice that there is a case and the alleged seller turns out to be an accomplice of mercenaries. Have you read the info; it is possible for you to warn him. Select YOU ARE IN DANGER and warn the man. He will turn against Picus and surrender the Reader. Then reply with YOU CAN GO. SM 06 continues to lead you to a safe place in which you shall read the disc in security. Make your way back to your apartment and interact with the reader on the table. Your TV will reveal to you gradually the truth and show who is Helle. Here you may call the result in two different ways. You can confirm Helle that you remember everything, or to history question, provided you don’t know. At the end Helle shall defines. Explain her term KI correctly, the true form of Helle disclosed. After the chat SM 06 will end and you’ll be able to unlock trophy 01011000.